Cat Worming - How to Keep Your Kitty Free From Deworms! Cats are considered immune to many diseases and dont easily show symptoms even if they have one. However, most of them have worm infection by birth and are transferable to humans as well, which is why it is important to deworm your cats regularly. Cats are generally infected by two types of worms i.e. tapeworms and roundworms. In some cases, hookworms can also be found in the cat’s system. These parasites reside in the intestines and draw their nutrition from the internal linings of the tissue thereby making the cat weak and lethargic. Some cats may even experience vomiting and diarrhea if they have heavy worm infestation. Roundworms – Toxocara Cati and toxocaris leonina are the two roundworm species that infect cats either by contaminated surroundings or through the ingestion of other infected cat’s feces that contain roundworm eggs. Queens can also pass Toxocara cati in their kittens through feeding and is quite a common way the infection passes from one to other cats. Other species of roundworms that also infect cats include – Ollulanus tricuspis, Gnathostoma spp, Strongyloides spp, and Physaloptera spp. Tapeworms – Dipylidium caninum is the tapeworm species that is usually passed on to the kitties via flea bites whereas Taenia taeniaeformis are passed on to cats when they prey on rodents who carry the eggs in their system. Some other species that infect cats are – Diphylobothrium latum, Spirometra spp, Echinococcus multilocular, Diplopylidium spp, and Joyeuxiella spp. These long, flat worms appear as rice-like grains in the cat’s feces and may cause excessive hind itching in kitties. How Often Should You Deworm Cats? The kittens over 3 weeks of age must be dewormed every 2 weeks until 2 months of age. The dose must then be reduced to once a month after 6 months. Adult cats, on the other hand, must be treated every 2-3 months for roundworms and tapeworms. Along with deworming treatments, it is necessary to treat the cat for flea infestation as fleas are the major carriers of tapeworms in cats. [Read] Is Your Cat Throwing Up Worms? 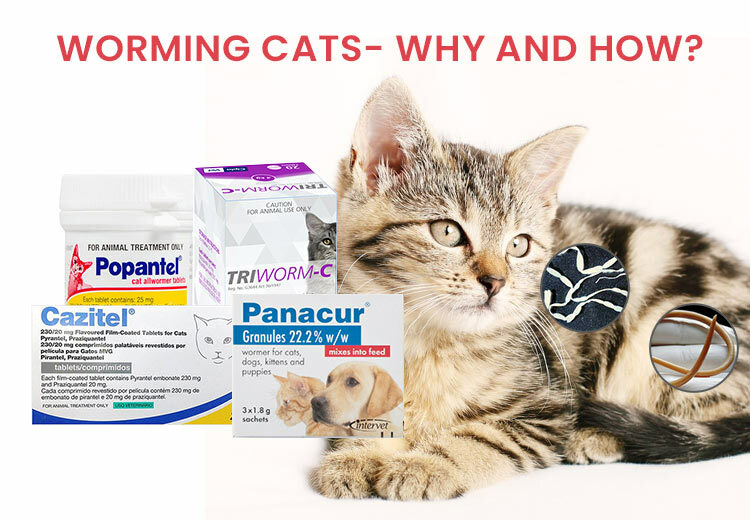 Popantel – The two ingredients Praziquantel and Pyrantel emboate in this product act against roundworms, hookworms, and tapeworms thus making Popantel one of the most suitable products for treating cats of intestinal worms. The product is completely safe for pregnant and lactating cats and kittens can also be treated for worms using Popantel from the age of 2 weeks. Panacur Granules – These anthelmintic granules treats intestinal worms like Toxocara cati and toxascaris leolina. The product also treats hookworms and tapeworms and can be safely used in pregnant kitties as well. Triworm C – It is a broad-spectrum drug that treats infection caused by tapeworms, hookworms and small roundworms with a single pill. The treatment is completely safe for old as well as young cats and is one of the most reputed worming treatment for cats in the market. Cazitel– A product by Pfizer, Cazitel treats all four types of worms in cats – roundworms, hookworms, whipworms and tapeworms and can be safely used in kittens over 6 weeks of age. You can choose either of these products but make sure you follow the guidelines on the label thoroughly for the product to work with its full efficacy. Worms feed off immense nutrition from a cat’s fragile body, making her malnourished and vulnerable to diseases and thus worming should be an essential part of your cat’s health care regimen to help her live happier and longer.